HON Attune Series Credenza HON11807RFF $640.91 Attune laminate desking combines a contemporary look with the durability and flexibility needed to improve productivity. With an array of work space storage components, Attune makes it easy to maximize your comfort level and personalize your work space and configuration needs. Contemporary design includes mixed materials, vertical matched woodgrain, floating modesty panels, and slim profile pedestals. Unique adjustable hutch features large storagedisplay cabinet with adjustable shelves. 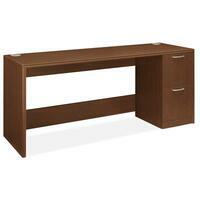 Under credenza pullout printer shelf maximizes underdesk space, and drawer provides additional storage. Pullout printer shelf optimizes underdesk space. Storage drawer allows you to store some personal items. Large storage cabinet has an adjustable shelf. Open modesty panels allow access to powerdata wall outlets. Integrated wire management includes grommets and wire clips. Furniture is sold separately.